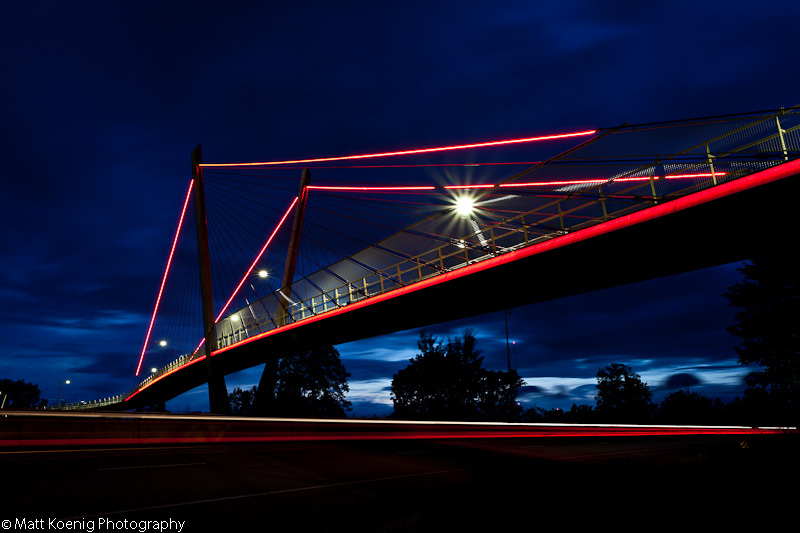 Last night a friend and I took an evening photo shoot of the Delta Ponds Pedestrian Bridge. 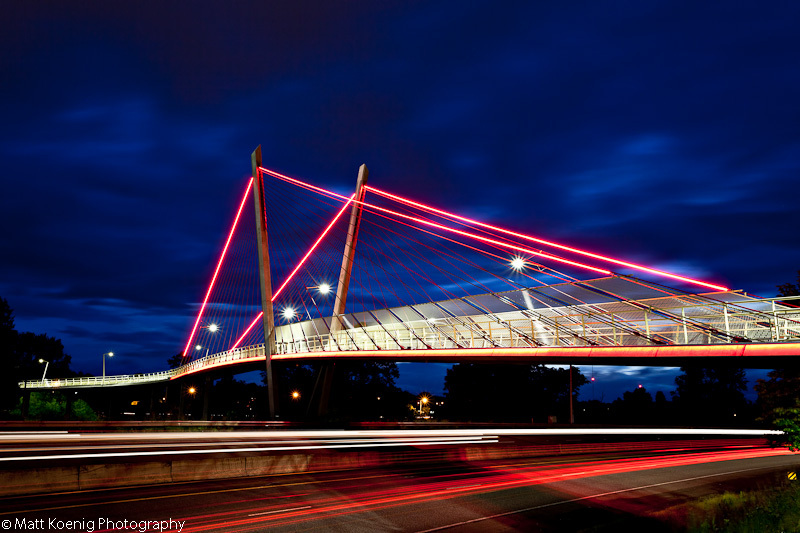 At dusk the bridge lights up and looks like it is supported by glowing red lightsabers (at least that is what my kids say). Using my sunrise/sunset app on my iPhone I saw that sunset was 8:44 so we cruised down around 8:30 and got setup. I was shooting with a Canon 5D Mark II and my friend with the Canon 50D. At the start I had on my Canon 70-200 f/4L but found that a wider angle was going to work better so I swapped on my Canon 17-40 f/4L which is one of my favorite lenses to shoot with. Of course for these long exposure night shots you want to have a sturdy tripod. I use the Manfrotto 055XPROB with the Manfrotto 322RC2 head which is a great combination that performs well and doesn’t break the bank. So we’re all setup and shooting a few test shots and waiting for the light to hit that sweet spot when up rides Eugene local Peter Herley. Peter is a local artist, a painter, who does some really colorful abstracts. He talked to us a bit about the Eugene Storefront Art Project before heading on his way. Very nice guy and it was a pleasure to meet him. As the sun started to set and the skies hit that magical time we started shooting. At first I was shooting ISO 50 with an aperture setting of f/22 and shutter speeds of 5-8 seconds. I was using the Live View feature of the 5D to focus as sometimes the lens likes to hunt a bit in low light situations. But by using the LCD screen and zooming in I can manually focus the lens and really nail that detail. As the light started to disappear behind the horizon it lit up thin pockets in the clouds which created a very dramatic effect. Now I was shooting at ISO100, f/18 and 30 second exposures. This allowed me to get the light trails from the passing cars and created a smooth appearance in the clouds. The image above is probably my favorite from the evening but I did take another that has a darker feel to it and was taken at a different angle. Although it tends to show less of the bridge I still like the darkness of this shot. Finally the last remnants of the setting sun gave up and the skies went dark. Overall I’m pretty happy with this shoot and the results. You can check out my friend Mike’s shot here. I still want to get back and take some photos from on the bridge. Hopefully we’ll continue to have some dramatic skies. So which image do you prefer? The darker mysterious image or the lighter image that shows more of the bridge? If you enjoyed this article consider sharing it with a friend. You can also stay up to date with all future posts by signing up to receive the RSS Feed. Hey Matt, great photo’s…both of them. But I definitely prefer the first one, the lighter one that shows more of the bridge. I think the sky and cloud formation are more pronounced in that shot. Plus the wider view gives the bridge more of a presence in the photo. I find my eyes following the arc of the bridge to the left and on up into the clouds . Very dramatic! JMHO. Thanks for the post! Thanks! Yeah the first image is what the majority of people are liking better. I still like the darkness of the second but the expansiveness of the bridge in the first definitely looks better. I’ve always enjoyed these long exposure shots. Of these two the first image is definitely the strongest. It is way more dynamic and lights are way more compelling. Hi Eddy! Thanks so much for commenting. I definitely agree with you. When I was looking at all the images after the shoot the bottom one caught my eye as I liked the sky in that one. But the first definitely shows the entire bridge in a better light and position.